Maryland’s Favorite Gourmet Popcorn is at EC Pops in Historic Ellicott City! EC Pops is a deliciously whimsical gourmet popcorn and gift store in the heart of Historic Ellicott City. 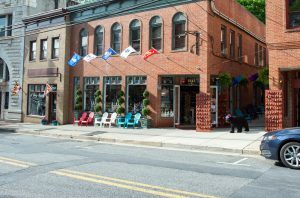 EC Pops is a deliciously whimsical gourmet popcorn and gift store in the heart of Historic Ellicott City. Our store combines the best elements of a vintage candy store with our creative and delectable takes on traditional popcorn flavors. We offer a wide variety of sweet and savory flavors that your whole family will enjoy. We’ve created a fun atmosphere where our guests can shop, dance, and taste our delicious popcorn. You can purchase your popcorn in bags, or in one of our decorative tins. Our tins make great gifts! Speaking of gifts, EC Pops has our very own gift-wrapping station! Corporate gifts, birthday gifts, party favors, and more can be wrapped up and personalized just for you to give to your friends, family, other loved ones, and even clients! Want to give something extra special? Browse our huge selection of jams, jellies, dipping sauces, fudge, candy, and sodas and make the perfect gift basket. With all of our popcorn flavors and other specialty items to choose from, the possibilities are endless! EC Pops offers over 50 different delicious popcorn flavors. For the more traditional popcorn connoisseur, we have kettle corn and buttered popcorn. Our traditional kettle popcorn is our take on a summertime classic. If you love amusement parks, or the state fair, this popcorn will take you back. With its delectable combination of sweet and salty flavors, you won’t be able to get enough. We promise your whole family will love it! Our rich buttered popcorn can make any day feel like a trip to the movies. Have a movie night in with buttered popcorn from EC Pops! Chocoholics will love our 13 different chocolate flavors. For visitors who prefer more savory snacks, we have 17 different cheesy flavors. Our 15 varieties of candied popcorn and 4 different caramel flavors are sure to satisfy even the most discerning sweet tooth. No matter what flavors you prefer, EC Pops has something for everyone. Along with our more than 50 flavors of popcorn, EC Pops also offers a selection of candy, soda, and homemade fudge! Our delicious homemade fudge comes in rich, creamy flavors like caramel chocolate peanut and orange creamsicle. Our fun candy selection includes a wide variety of childhood favorites like gummy bears, chocolate bars, and pick-your-own jelly bean mixes. In the summer time, you’ll be able to come in and cool off with a sweet, icy snowball (or a snow cone, depending on where you’re from!). Be sure to pick up a jar or two of our homemade jellies and preserves to take home and enjoy with your favorite toast, biscuit, or bagel. You can even just enjoy them right off a spoon, we won’t judge! If you’d prefer something a bit more savory, EC Pops offers a full line of barbecue and dipping sauces made to smother over whatever you want! Would You Like Something to Drink? Just like our gourmet popcorn, our drink selection is anything but ordinary. EC Pops has an entire wall dedicated to classic and extraordinary soda pops. Looking for classic Coke in a glass bottle? Wishing someone would create a Brownie Caramel Cream Root Beer for you to enjoy? Look no further! All of our sodas are kept ice cold in a vintage Coca Cola cooler, so you can pop the top and enjoy them right here in our store! We hold all of our sodas and drinkable delights to the same high standards we hold our popcorn. Founded in 1772, the historic town of Ellicott City, Maryland is located on the bank of the Tiber River. Over the course of its history, Ellicott City has been home to several mills. Because of this thriving industry, in 1830 the town became the first stop for the Baltimore and Ohio Railroad (B&O Railroad) outside of Baltimore. Because of its close proximity to the Tiber River, a tributary of the nearby Patapsco River, Historic Ellicott City has seen several devastating floods over the years. Homes, businesses, and even some lives have been lost. But, after each of these terrible occurrences, the town of Ellicott City has banded together to rebuild and move on. The EC Pops family is proud to join this town of hard-working, perseverant people. Our store is located at 8143 Main Street, but you can hear our up-beat music from a block away. After the awful events of the flooding in 2016, we saw how the people of Ellicott City and the State of Maryland came together to rebuild this historic town and we just knew that this would be our kind of place. EC Pops opened its doors in the spring of 2017. When you’re strolling down Ellicott City’s Main Street, you will hear our music. Step into EC Pops, and you will find employees and customers dancing, having fun, and tasting our delicious popcorn. If you’re looking for something specific, all you need to do is ask. Everyone who works here is glad to help you find that perfect something, whether it’s for you or for someone else. Our kitchen is located right here in the back of our flagship store. All of EC Pops’ popcorn is hand-popped here and covered in our delicious, decadent flavors. Maryland’s Favorite Popcorn Can be Delivered! If you’re too far away for a road trip or want to give the gift of EC Pops, feel free to order your favorite flavors from our website and we will ship it anywhere in the US! We understand that you can’t always get here, so we’ve made our popcorn available online. Whether you’re craving it for yourself or gifting to someone else, our more than 50 popcorn flavors online are bagged up and ready to go wherever they need to go! Did Someone Say, “Free Samples”? Indeed, we did! Step into our flagship store on Main Street in Historic Ellicott City, Maryland and you will see for yourself! Our shelves are lined with bags of our delicious popcorn, ready to go home with you! Since most people like to try it before they buy it, we have samples of all of our 50+ flavors of popcorn ready to wow even the most discerning taste buds. EC Pops is a gourmet popcorn purveyor owned and operated in Ellicott City, Maryland. We are proud to offer the best gourmet popcorn, locally-sourced sweets, refreshing snowballs, delightful sodas, and gifts that the whole family can enjoy. Enjoy our popcorn wherever you are with bagged popcorn delivered straight to your door. If you’re ready for a taste of Maryland’s favorite popcorn, visit our charming storefront to taste it for yourself. Our store is packed to the brim with your childhood favorites and modern twists on the classics including handcrafted gourmet popcorn, homemade fudge, refreshing snowballs, and fun gifts. EC Pops always has at least 50 flavors in stock ranging from Great Garlic and Parmesan to Sea Salt Caramel — and you’ll get to try every last one! Have any questions? Give us a call at 410-750-POPS (7677) or email info@ecpops.com. Do you “like” and “follow”? Be sure to like and follow our social media pages on Facebook, Twitter, Google+, and Pinterest for all the latest updates. This entry was posted on Friday, September 29th, 2017 at 11:09 am. Both comments and pings are currently closed. Celebrate Memorial Day with EC Pops! Out of State Friends and Relatives? Send Them Maryland Gifts from EC Pops! Plan a New Year’s Eve Party with EC Pops! Jams, Jellies, and Webkinz, Oh My! Get Your Last-Minute Gifts at EC Pops!